Pure vanilla is one of the best flavors around, but adding a little honey makes a good thing better. Case in point, this honey vanilla ice cream. Not only does the honey add a hint of flavor, it enhances the ice cream’s texture. 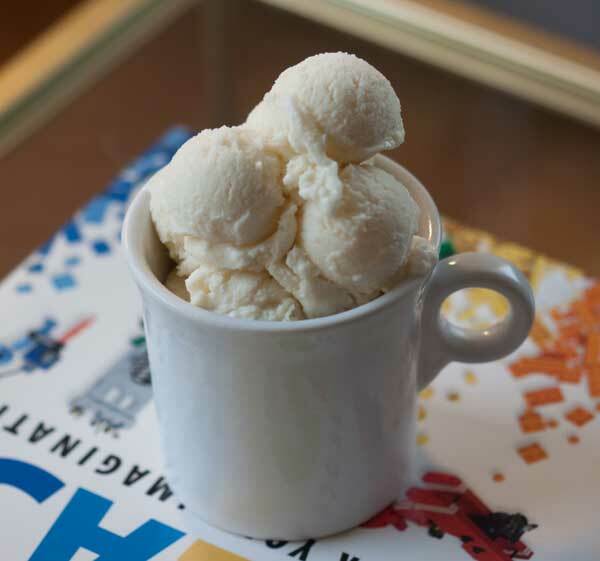 Unlike some homemade ice creams that are great on day 1 but rock hard and need to soften a bit before serving on day 2, this honey vanilla ice cream was easy to scoop on both days. The honey provides two benefits: it adds flavor and enhances texture. My only complaint towards this recipe, an old one from Southern Living, is it makes too much for a small family. I quartered it and made a little less than a quart. If you have a modern ice cream maker and make the full batch, you might want to make all the custard and just process half at a time. This recipe makes about 3 quarts of honey vanilla ice cream. If your ice cream maker can't hold all the batter you can process it in batches or halve or even quarter the recipe. In another bowl, mix together the flour, sugar and salt. In a heavy 3 quart saucepan, heat the milk over medium low and gradually add sugar mixture, stirring constantly for about 8 minutes or until it thickens to the consistency of thin gravy. It will not be as thick as pudding or cream gravy at this point, but it will be slightly thicker and smoother than when you began. Whisk about a fourth of the milk mixture into the eggs, then pour the egg/milk mixture back into the saucepan and continue stirring for about 2 minutes or until eggs are fully incorporated and mixture is slightly thicker. If you have any lumps (such as bits of eggs), pour through a sieve. If no lumps, pour directly into a bowl. Let cool slightly at room temperature than chill for several hours. Add the half & half and the vanilla to the custard mixture and freeze in batches per your ice cream machine’s directions. Towards the end of the cycle, pour in the honey (if making in batches, use a fraction of the honey for each batch) and let the machine mix it a bit, then remove the dasher and stir mixture until honey is fully blended. Pour the ice cream into containers and freeze until firm enough to scoop. This recipes is adapted from an old one I found in Southern Living. It makes a lot of custard but is easy to halve or quarter if needed. If you make a quarter batch it won't take quite as long to thicken when you stir together the milk and sugar mixture. If you are halving or quartering, you can beat two eggs together and weigh out the appropriate amount. If you halve it, use 125 grams of eggs. If you quarter, use about 62 grams. I had some issues with the egg white cooking when I poured the hot mixture into the eggs, but it wasn't a huge deal and I was able to remove the bits with a slotted spoon. Next time I might try mixing about 1/34 cup of the sugar in with the eggs so that the eggs will have a buffer when the hot milk mixture is added and won't be liable to cook. Sounds delicious as is, but I bet it would be fantastic in Baklava Ice Cream. Maybe, mixed or topped with cinnamon and sugar crusted-phyllo dough and chopped walnuts. I know I’m going to be dreaming about this ice cream tonight!